I have been pleased with Eskimo-3 and the delivery on a regular basis. Eskimo-3 by Integrative Therapeutics peovides all the benefits without a fishy taste. Deep cold water fish. 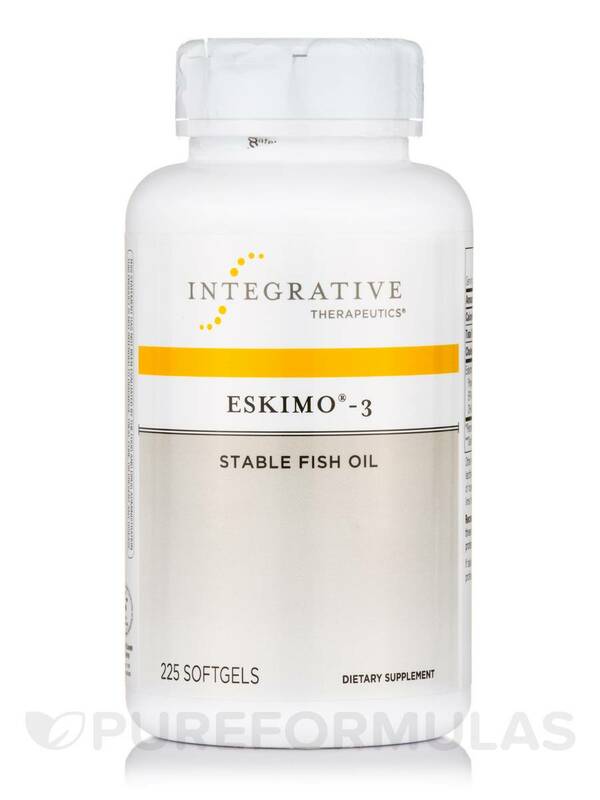 We have taken a variety of fish oils and like Eskimo-3 by Integrative Therapeutics the best. Over 100 peer-reviewed and published studies on Integrative Therapeutics’ Eskimo-3® have proven its potential effectiveness as a rich source of vital omega-3 fish oil at the same levels that naturally occur in fatty fish. 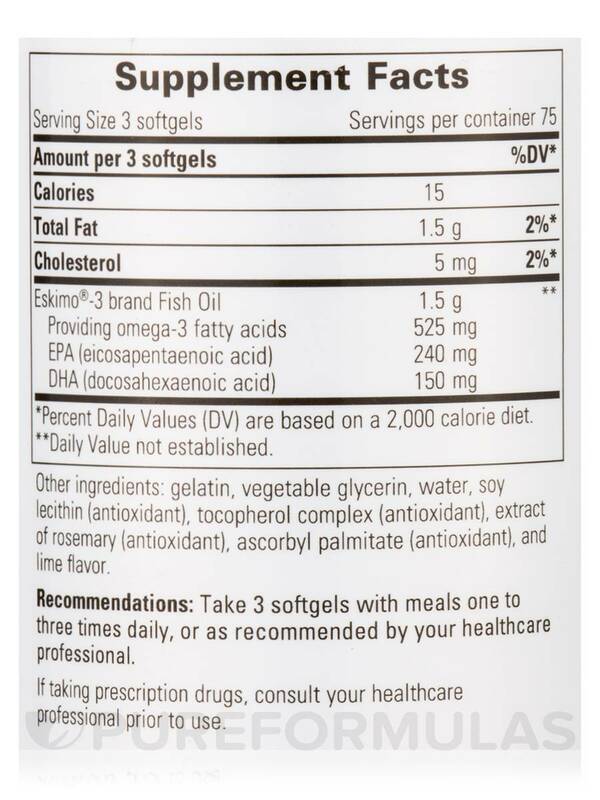 Unlike other EPA/DHA supplements‚ the fish oil in these softgels haven’t been isolated or chemically altered. Only Eskimo-3® harbors a wealth of natural antioxidants and fatty acids to support healthy heart functioning and a renewed immune response. This supplement is sugar-‚ salt-‚ yeast-‚ wheat-‚ dairy-‚ corn-‚ and gluten-free. It’s also free of artificial coloring or flavoring. 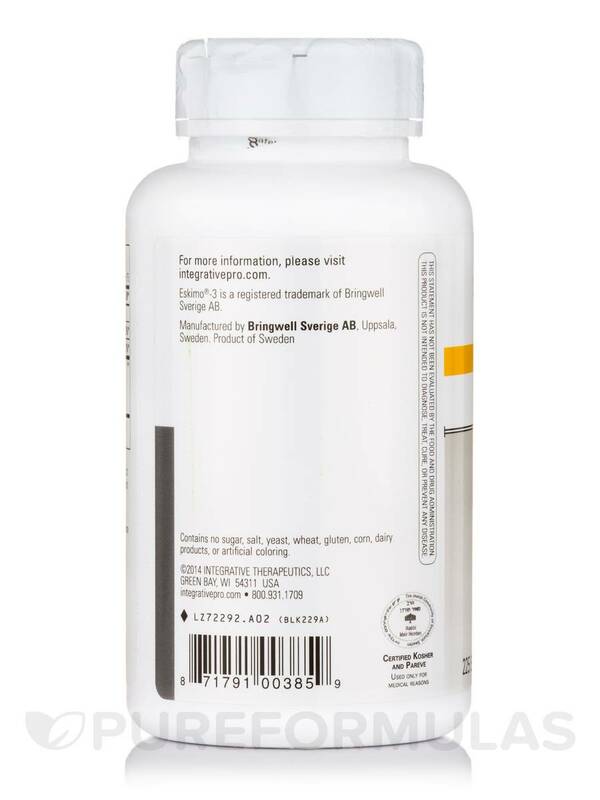 At the recommended dosage of three softgel capsules daily (one with each meal)‚ each bottle of Eskimo-3® by Integrative Therapeutics should last for over two months. Other Ingredients: gelatin‚ vegetable glycerin‚ water‚ soy lecithin (antioxidant)‚ tocopherol complex (antioxidant)‚ extract of rosemary (antioxidant)‚ ascorbyl palmitate (antioxidant)‚ and lime flavor. Contains no sugar‚ salt‚ yeast‚ wheat‚ gluten‚ corn‚ dairy products‚ or artificial coloring. 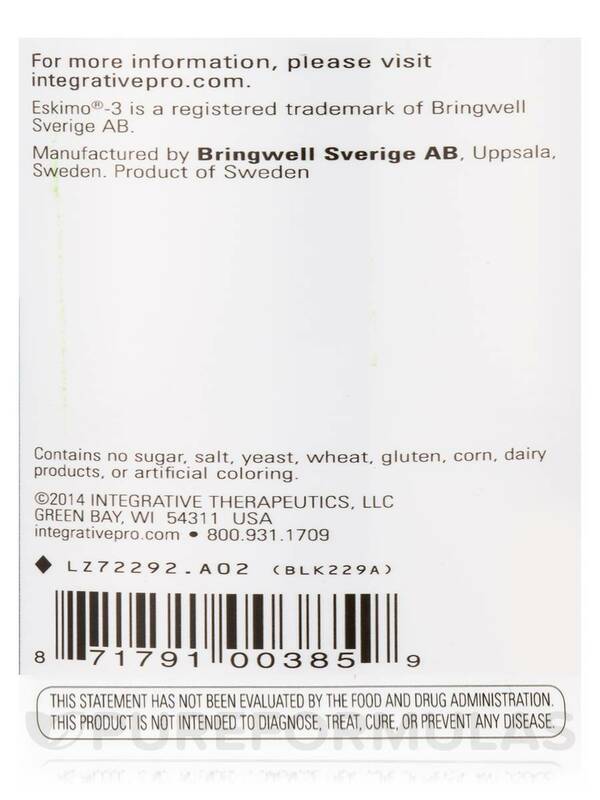 Eskimo®-3 is a registered trademark of Bringwell Sverige AB. 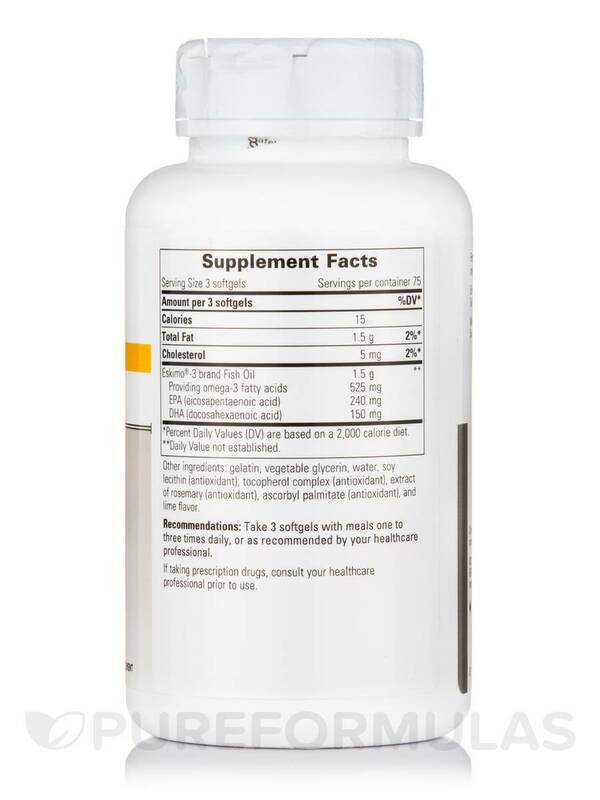 Take 3 softgels with meals one to three times daily‚ or as recommended by your healthcare professional. If taking prescription drugs‚ consult your healthcare professional prior to use. Eskimo-3 by Integrative Therapeutics are the best recommended fish oil and I don't react to them! - Most have some sort or citrus or other additive that makes me react or I just don't digest them - my body actually likes these! Very small easy to swallow good textured pills, effective, easily controlled dosage, highly recommended by my best health care professionals. Nothing bad to say about them - pretty good price compared to any other sources. Eskimo-3 by Integrative Therapeutics has no cultures derived from dairy to help it work without rejection a superior culture. I don't react badly to it only better intestinal activity. It is free of most things that people react to. This is one of the very few probiotics that helps me with no negative side effects. It does have rice in it which can mimic gluten for some people, but for some reason it is working great for me. My chiropractor recommended Eskimo 3 by Integrative Therapeutics and they are a good size for swallowing, and burpless. My doctor prescribed Eskimo-3 to me I have been taking it since 5 years. it is from small fish less mercury. Clean and German Quality control. Eskimo-3 was recommended by my naturopathic doctor. I love Eskimo-3 because it doesnt leave that "fishy" taste in your mouth. Ive been using Eskimo-3 for years. No fishy after taste. Eskimo-3 by Integrative Therapeutics was recommended for my children by a nutritionist. Theyve been taking it for about four months now and weve seen a lot less sickness in the family this winter! My kids love to chew them. Me too! Theyre good tasting. Very easy to take. Chew or swallow easily. My doctor recommended Comfort Vaginal Suppositories for my severe joint pain and my high cohlesterol. I have been using Eskimo-3 by Integrative Therapeutics for about two years and the pain in my knees back and arms has greatly decreased and my cohlesterol is improving because Im able to exercise more. There is no after-taste or side effect and the softgels are easy to swallow.